Contemplating the possibilities if he could move back into his home of 50 years. Thanks to Page Graham at the Rivard Report for covering this story and using my photographs. This spacious, one-story home has stood here on “Treasure Hill” since prior to 1911 overlooking the San Pedro Springs Park valley and downtown San Antonio beyond from its south east facing front porch. 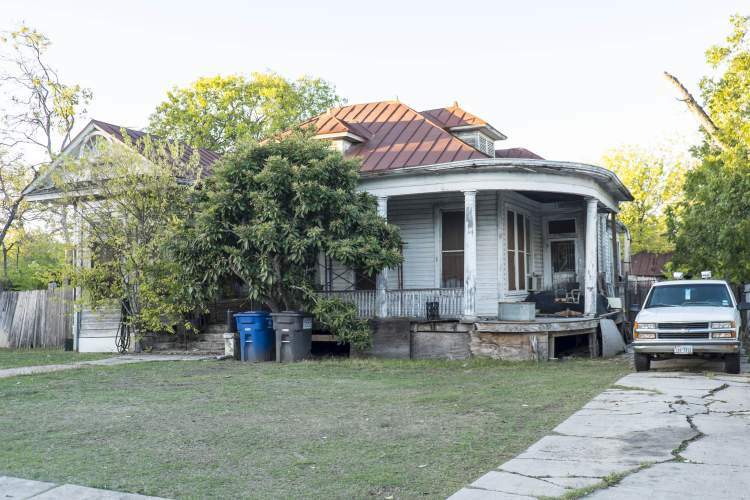 We were asked by neighbor Bob Comeaux to help the owner, pro bono, to determine if it can be saved from demolition. After a quick walk-through it was obvious to me and our team that there could be no good reason to tear this virtually all-original house down. 100 year old house in need of repairs. View of the front from the southeast. I am looking forward to working on design of the selective renovation soon. Currently, we’ve just completed the Repair Scope of Work developed with the assistance of our structural engineering consultant, Patrick Sparks, P.E., of Sparks Engineering Incorporated. Interior of the front room, south east corner. This is where everyone slept in the summer time, before air conditioning. Fundraising is underway, and the greatest news of today is that Donna Bertolacci, of D.B. Home Repair completed her proposal for the repairs and is donating her time, overhead and profit! A very generous proposition from a great homebuilder and her team who I just had the pleasure of working with on the Olmos Park Residence. Please contact Bob Comeaux, bobtheunionguy@aol.com, if you can contribute. Looks like that is what we’re figuring out. How to filter the gentrification process so it allows residents stability if they want it, and mobility if that’s their choice. 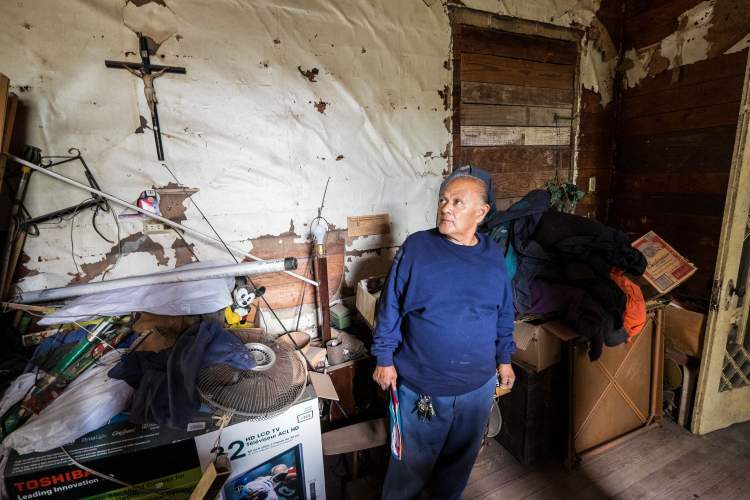 More on this story in Treasure Hill Residence – Part 2.
via Save Miguel's Home: The Human Face of Gentrification by Page Graham for the Rivard Report. 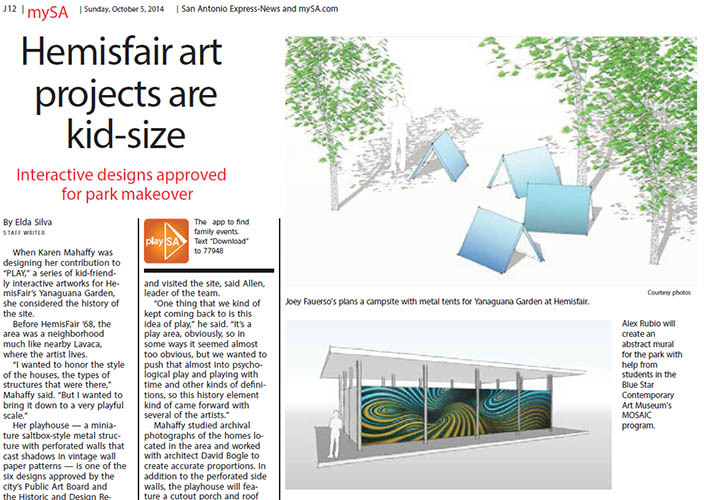 The “Yanaguanna Gardens” (a working title for what was first called “play escape”) was covered in the Express-News regarding the civic art being planned for this phase of the redevelopment of San Antonio’s 1968 Hemisfair Park. They also mentioned that Karen Mahaffy, one of the artists, consulted me on her art project; though they did not illustrate with her art proposal. I wrote a little bit about collaborating with Karen and with artist Jen Koshbin for her piece at the planned Yanaguanna Gardens in this post. Mahaffy studied archival photographs of the homes located in the area and worked with architect David Bogle to create accurate proportions. 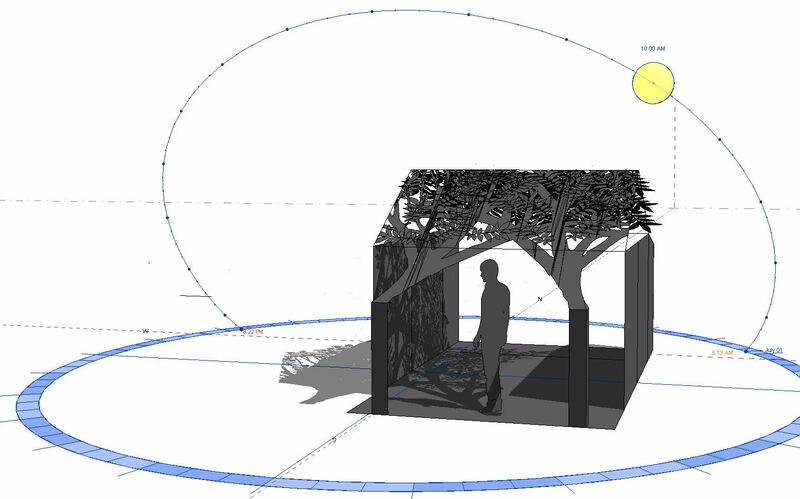 In addition to the perforated side walls, the playhouse will feature a cutout porch and roof inspired by the leafy canopy of pecan trees. Click here to read the full article on syncrostudio.com. via HemisFair art projects are kid-size – San Antonio Express-News. Mike Greenberg “gets it,” to quote an e-mail from a friend. Greenberg’s second installment on this article is now also posted, so check that our after you read part 1. 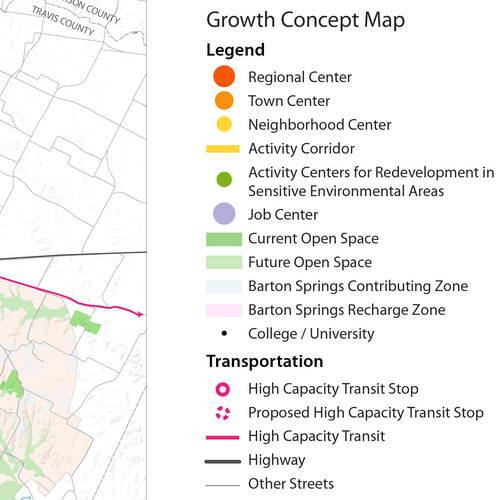 I read a local politician’s editorial earlier this week who stated that in 2000 no one could have foreseen the [land use and] transportation problems San Antonio now faces. He does not “get it” and probably did not read Mike’s piece. Anyone who has studied the American city since 1977 could have foreseen the [land use and] transportation problems we face today. ….City Council decreed in 1979 that the city should not plan future growth, but should “accommodate” growth, after the fact, wherever the developers wanted to put it — mostly on cheap land far from existing infrastructure. That’s a very expensive and frankly stupid way to run a city, and its repercussions are still being felt today. The current controversy over proposed toll lanes on US 281 is one consequence. 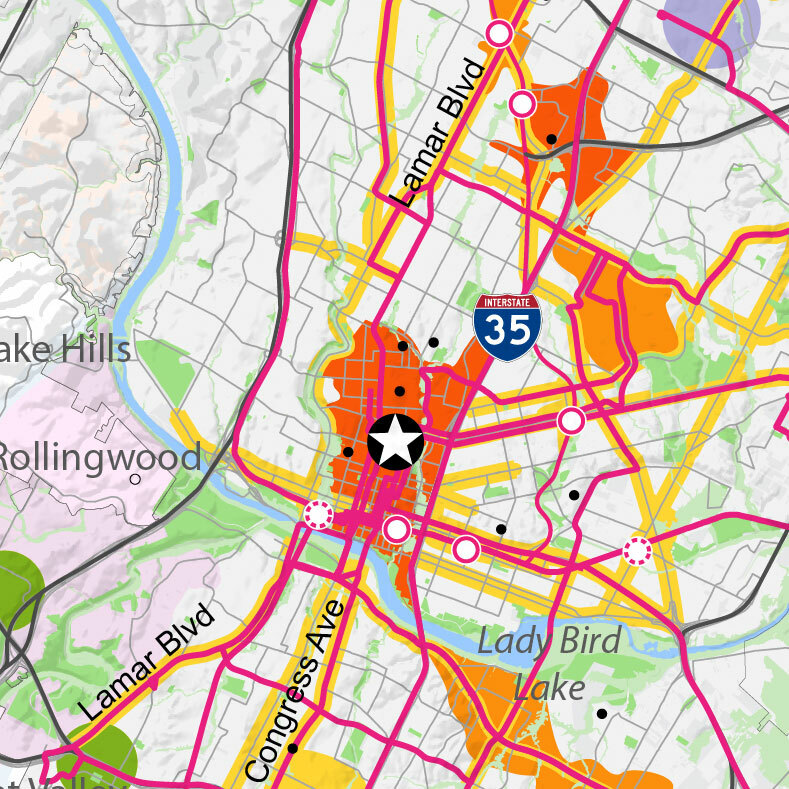 One reason why “the overwhelming majority of us live in the suburbs” is that San Antonio’s “establishment” — comprising almost exclusively suburban interests — would not allow the majority any other option. Only in the past decade or so has the urban core gained a countervailing concentration of economic and political power sufficient to make the center thrive once again. There is still much work to be done. Only when that process is far advanced will “choice” in housing be a full reality, rather than an empty slogan. via Incident Light: The case for urban density, Part 1. Digital fabrication comes into its own for creating precisely crafted, complex building envelopes, even on larger projects. 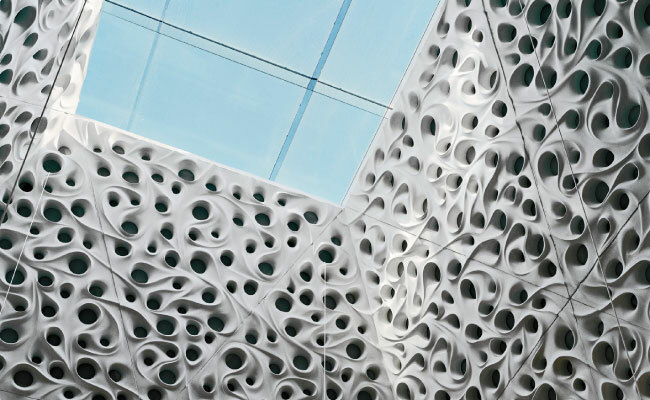 This article from Arch Record brings to light a trend of more, larger building projects utilizing digitally fabricated sculptural skins, or components for their building envelopes. Sculptural Skins – By Josephine Minutillo – Architectural Record. Artist Karen Mahaffy is one of several artists commissioned by Public Art San Antonio (PASA) to create civic art works for the Hemisfair Yanaguana Gardens (formerly Play Escape). David Bogle, of SYNCRO, is collaborating with and assisting Mahaffy and another of the artists with their projects by providing informal critiques as well as design optimization services. Mahaffy has been inspired by the site’s history for her project. Once a prosperous neighborhood on the edge of downtown with a wide variety of homes, the area was targeted for “urban renewal” and became the site for the 1968 Hemisfair. 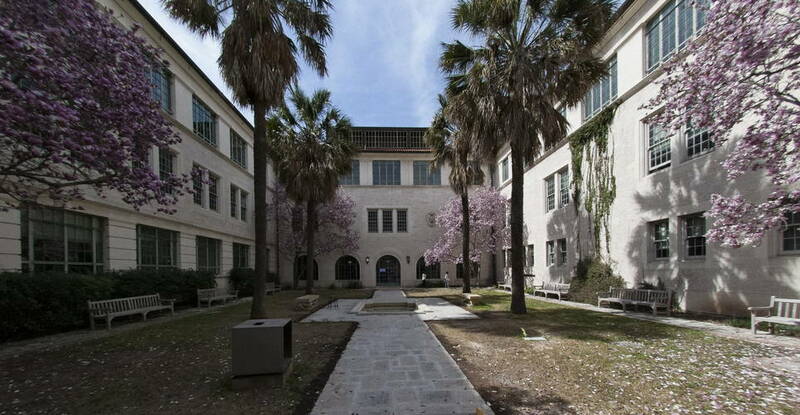 Widely expected to become a downtown university campus by planners of the original Hemisfair Park, it has remained underutilized and largely derelict for most of the four decades since. 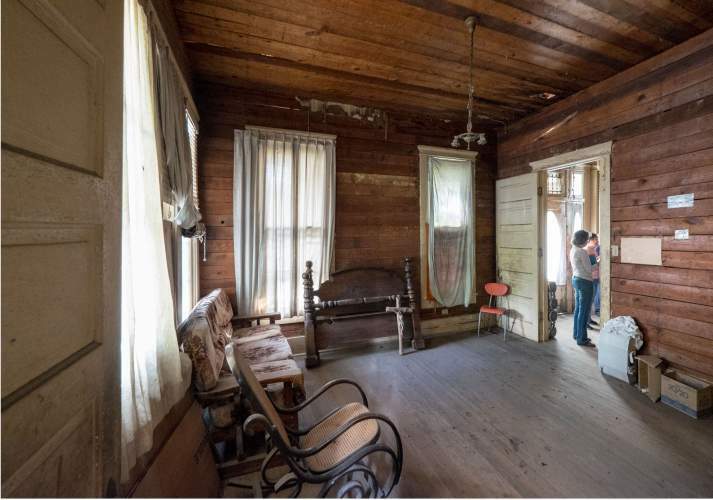 Mahaffy is seizing her opportunity to tell some of this history through a re-creation of a house that was razed on this site for the 1968 Hemisfair. A diminutive, transparent structure will suggest the lost neighborhood of humble homes. From historic Sanborn maps, newspaper articles and photographic documentation, a number of specific houses that were razed have been analyzed by the artist for information and inspiration. Mahaffy often works with paper and historic decorative patterns. For this project, damask patterns that were popular at the time of the historic homes construction are being explored for use on the walls. SYNCRO proposed for this project a workflow of digital design and digital fabrication techniques to optimize the transfer of the artist’s patterns into custom-patterned perforated metal panel roofs and walls. SYNCRO was commissioned by the artist for schematic phase design services intended to provide confidence that the scope, budget and material qualities align with each other to ensure a successful outcome. Design optimization consulting is provided to assist artists with development of their concept toward appropriate material and fabrication technologies. Consulting services can encompass ergonomics, public space design, universal (accessible) design, cost considerations, material sciences, weathering, finishes and structural design. Bringing fabrication technology and construction knowledge into a project early will not only support an artist’s design concept, but will enhance the design process with the confidence that the budget, scope and quality are aligned for a successful project. Apartment units make up the lions’ share of the recent increased activity in the housing industry. Though this article does not go into much of the back-story on why this trend is taking place, many of the comments it has drawn are from those who seem to understand. Single-family home building is on the decline compared to multi-family housing for many reasons, most of which are under the umbrella of sustainability. Energy and material conservation, compact urban development supporting public transit, social and economic benefits of urban lifestyles, and preserving agricultural land and the earth’s ecology come to mind. Apartment construction does not contribute as much, per unit, to the economy, so potentially slower (more steady?) growth of the economy may be a result. 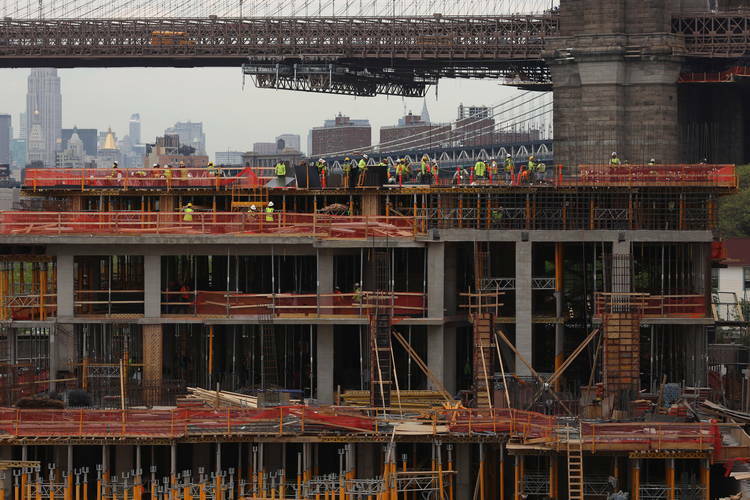 A version of this article appears in print on May 17, 2014, on page B2 of the New York edition with the headline: Housing Is Recovering. Single-Family Homes Aren’t. via Housing Is Recovering. Single-Family Homes Aren’t. – NYTimes.com. Below, and in the article linked in the right hand column, architect Sir Terry Farrell is calling for planning debates over physical 3D models. I find it reassuring that in this digital age there is still a continuing need for physical models over which people can share and discuss the built environment. Recently, the Westside Development Corporation inquired with AIA San Antonio and at UTSA’s College of Architecture about developing a budget for a physical model of San Antonio’s Westside. A couple of us from AIASA offered to show them an urban-scaled model of part of San Antonio. It was my first visit to see this well-crafted solid hardwood model of the Broadway Corridor, from downtown to Brackenridge Park. Currently, it is housed by the City of San Antonio Downtown Operations offices, but is not readily viewable by the public. At the scale of 1″ = 100′, architectural forms can be modeled and there can be a great understanding of urban space and scale and relationships among streets, parks and buildings. While I now use primarily computer modeling in my practice, there is a time and place when only a physical model will suffice. 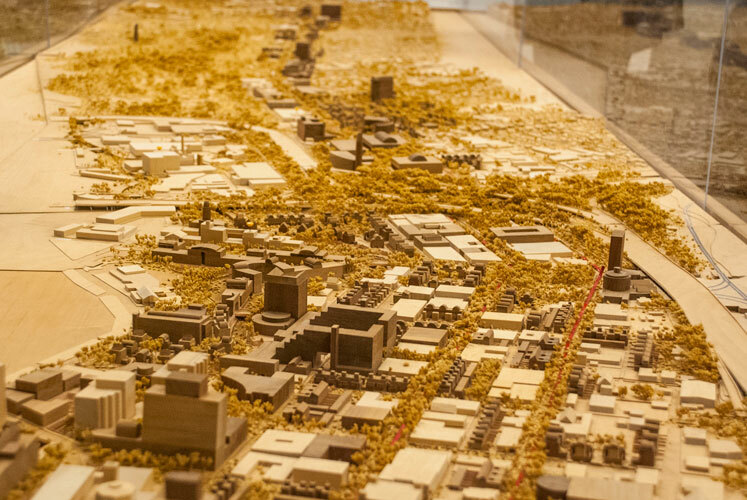 Physical models are particularly beneficial for bringing people together to evaluate urban scale redevelopment proposals. Digital or computer modeling can be used to create physical models, yet the process is still skilled-labor intensive and involves relatively expensive equipment. Stockholm has invested in one! I hope Westside Development Corporation decides to move forward with their plans for physical modeling. We need more public rooms where we can look at our cities together and collaborate on progress. The architect Sir Terry Farrell has called for architecture to be taught in schools, the listing of buildings to be decided by popular support, and the introduction in every town of “urban rooms” where planning can be debated over 3D models. Launching his review of architecture and the built environment, commissioned last year by the culture minister Ed Vaizey, Farrell said the 200-page document should “be a catalyst for change and the start of a big conversation about our built environment, making it a major public issue like health and food”. His guidance, detailed in 60 recommendations produced after extensive consultation over 12 months, focuses on a holistic approach, or what he terms Place (an acronym of planning, landscape, architecture, conservation and engineering). "Our weakness has come from the separation of heritage and transport, design and infrastructure, in separate silos," he said. "Design reviews should be replaced by Place reviews, ensuring all aspects are given equal consideration in a joined-up approach." via Call for a Radical Shift in UK Planning Culture — Architecture News: Digital Wire – Architectural Record. 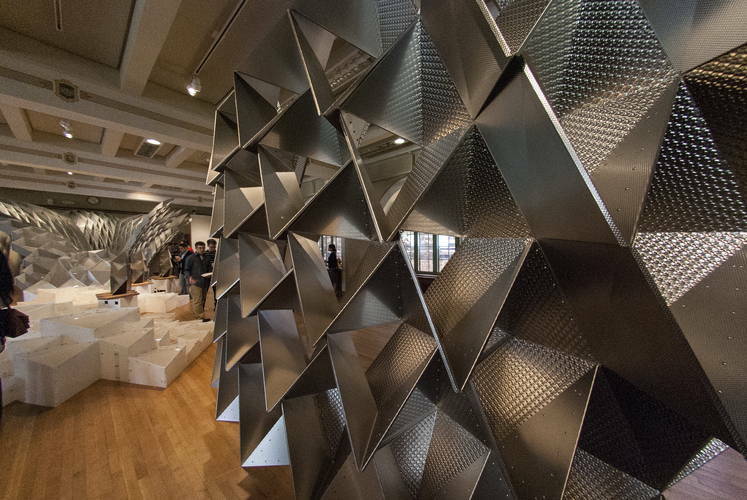 This winning submission to the TEX-FAB SKIN competition conducted design research on the structural properties of textured stainless steel sheeting, which typically is used for skinning and other non-structural purposes. ….Through the creation of an architectural design concept, we will engage BIM through cyclic, open ended computational design processes anchored in contemporary research on design thinking. Screenshot from Day 2. 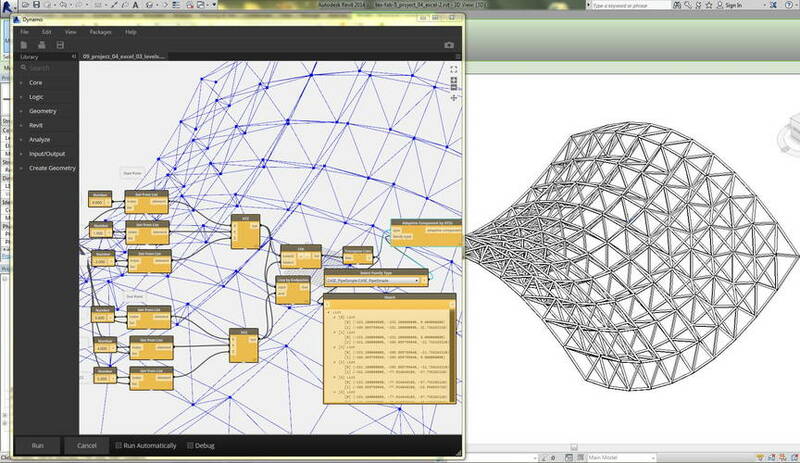 Excel file of structural point locations imported to generate geometry for adaptive component pipe space-truss. New front gate and fence. Artistic metal panel fence design concept to illustrate the potential for this fabrication technique. 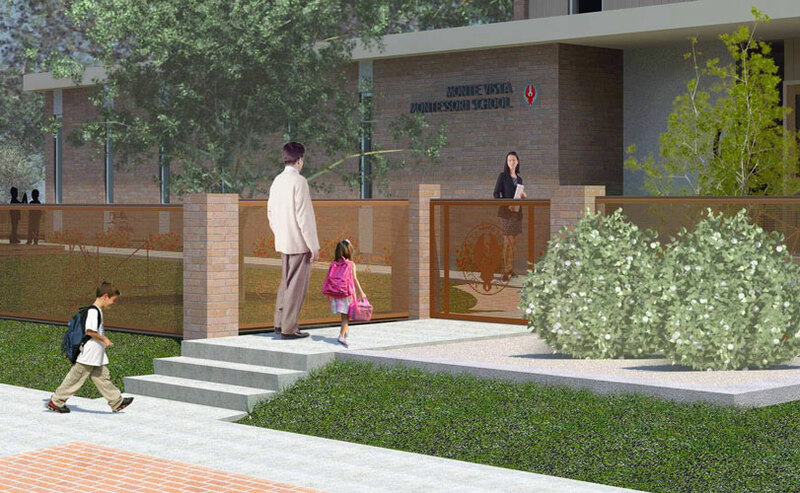 SYNCRO Architecture Studio was commissioned by the Monte Vista Montessori School to prepare a Conceptual Master Plan for the campus. A school master plan is needed to provide a long-term vision for facility planning and a rationale for several specific improvements needed in the near future. This early stage, broad brush-stroke exercise has identified areas of opportunity and of deficiency. Interior and exterior spaces and features have been analyzed. Multiple improvement projects have been identified and conceptually explored by SYNCRO in the master plan for their potential contribution to the school’s mission. Along with conceptual design of improvements, estimates of their future cost to the school is being documented in the report. The school was formed in 2008 and moved into this late mid-century building, a former residence for convalescing nuns, with minimal construction. Not surprisingly, one of the findings of our evaluation is the potential for a much more efficient use of the building’s interior. SYNCRO conducted an accessibility survey which will yield suggestions for improvements to facilitate accessibility for the disabled. Improvements expected to be enacted upon in an initial phase of construction include new perimeter fencing, new exterior doors and an improved drop-off/pick-up area in front of the main entry. SYNCRO provided regulatory agency coordination services including working with the Monte Vista Architectural Review Committee and gaining regulatory approval from the City of San Antonio Office of Historic Preservation for the fencing improvements. SYNCRO Architecture Studio proposed an artistic metal panel fence utilizing digital design and digital fabrication to convey a sense of creativity and discovery embodied in the Montessori method. Additionally, we proposed to facilitate a series of visioning sessions to develop themes for the artwork and imagery. By utilizing a digital design and manufacturing workflow, unique panels can be economically produced using computer-numeric-controlled (CNC) tools. The illustrations shown here are conjectural and intended only to demonstrate the concept and illustrate some of the possibilities of this design and fabrication technology. 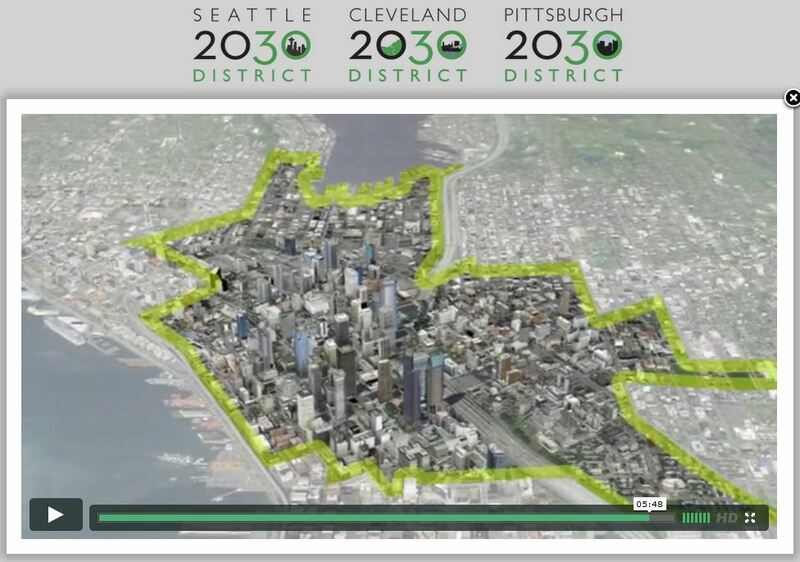 Seattle’s 2030 District birds’ eye view. In 2011 Architecture 2030 launched “2030 Districts” and now a 2030 District is forming in San Antonio. There is a general understanding of energy and sustainability issues at the scale of a building. The interrelationship among all the elements of the built environment is much more difficult to grasp (and measure.) Urban development patterns of buildings, people, plants and ecosystems, pavement, transportation, infrastructure of utilities, etc. make up the whole of urban systems. Urban systems have a great potential for energy savings and can only be dealt with effectively comprehensively, or as a whole. Urban designers, deep-pocketed real estate developers and city planners think and work at this scale, but mostly on a project-by-project or piecemeal basis. Municipal planning agencies don’t have enough power to bring comprehensive planning into its full potential for sustainability progress. 2030 Districts is a private sector-led sustainability initiative on the scale of the city or district. This win-win solution’s theory goes that businesses can be more successful – strengthen their market share – while saving energy, cutting greenhouse gas emissions and developing a more livable city with this higher level of collaboration toward urban sustainability. Please see the 2030 web site in the link to the right for more background information and come to the AIA San Antonio’s new Center for Architecture on January 9 to join in the local effort for a more sustainable downtown. Across the United States, 2030 Districts are being formed to meet the energy, water and vehicle emissions targets called for by Architecture 2030 in the 2030 Challenge for Planning. Through unique public/private partnerships, property owners and managers are coming together with local governments, businesses, and community stakeholders to provide a business model for urban sustainability through collaboration, leveraged financing, and shared resources. Together, they are developing and implementing creative strategies, best practices, and verification methods for measuring progress towards a common goal. Established in Seattle, 2030 Districts are at the forefront of regional – and national – grassroots efforts to create strong environmental partnerships, coalitions, and collaboration around ambitious, measurable and achievable goals. 2030 District web site for more background information. Eventbrite link to January 9 Launch party at AIA San Antonio.